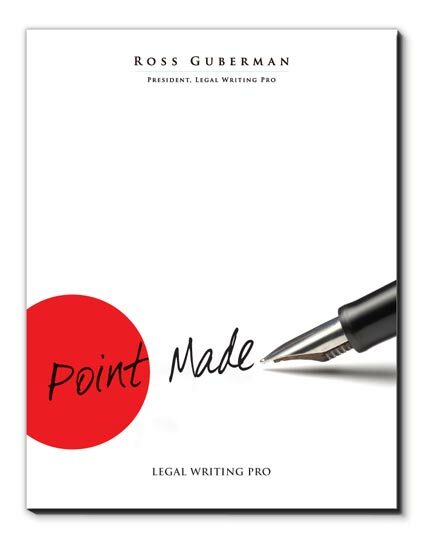 Many litigators write well. But how many write like Elena Kagan, Paul Clement, Seth Waxman, Walter Dellinger, Ted Olson, Maureen Mahoney, Eric Holder, David Boies, John Roberts, or Brendan Sullivan? If you want to get closer to the top, this new workshop offers concrete ways to do so. After reviewing more than 500 motions and briefs from the most renowned advocates, I’ve identified specific techniques for everything from the first line of the introduction to the final sentence of the argument section. Examples come from dozens of advocates, dozens of trial and appellate filings, and specialties ranging from intellectual property to torts and criminal law. In three hours, you’ll go on a fast-paced tour of the best practices in advocacy writing. The program is also a companion to my book for Oxford University Press. If you’d like to learn more about our Point Made workshop, please fill out the contact form below.